Wiper blades are designed for mechanical cleaning of vehicle windscreen and rear screen from snow, water, road dirt and other contaminants. HOLA wiper range includes conventional and flat blades. 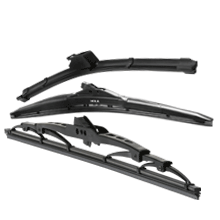 Conventional wiper blade structurally designed in classic style with metal frame. Frame of blade is produced from steel plate by cold forming and coated with high quality corrosion resistant galvanic plating followed by color coating. Rocker arms are jointed by thermoplastic elements which provide high mobility and reliability of joint frame parts. HOLA ™ flat blade consists of rubber element in grooves of which elastic plate from stainless steel is attached. Plate has parabolic shape, which provides equal pressure of cleaning rubber to glass. This construction has aerodynamic design, low profile due to frame absence, integrated spoiler, more correct pressing of rubber edge to glass, which allows improved cleaning at high speeds, reducing aero noise and improving visibility. Cleaning rubber has double edge made of natural high-compression material with graphite addition that leads to minimum friction coefficient and the absence of noise during operation. Both constructions are intended for all-year use. Simple and easy to install adapters provide reliable and quick installation of wiper blade to all often used wiper arm types. Easy installation and blade fail-safe fixing on wiper arm. Estimated operating life of HOLA™ wiper blades is more than 12 months in active operating (500 thousand double strokes)*.